After dinner, we made plans for the outing to Aït Benhaddou the following day. 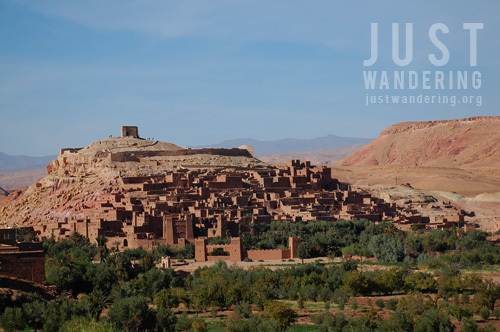 We were referred to Desert Dream, who tailored a tour based on what we wanted to do (go to Aït Benhaddou, that’s it). We agreed to a price and meeting time, shook hands and went to bed. 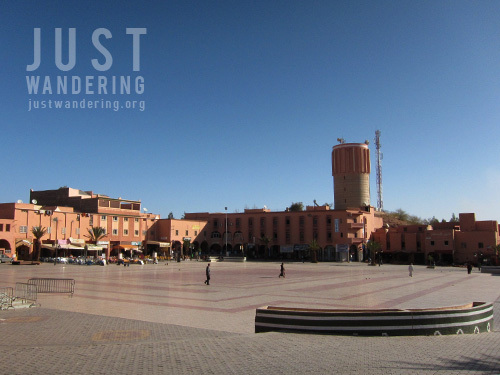 The following morning, we wandered around Ouarzazate. It was a small, quiet town and in the not-so-early morning, it was practically deserted. 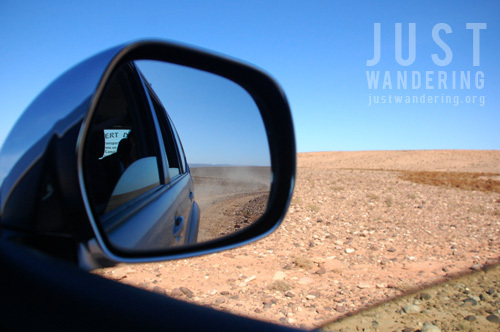 A lot of tourists pass here on the way to Erfoud or Merzouga, but not a lot of them stay. There were calls from a handful of shopkeepers to try their food or buy their wares, but they were quick to stop once they were ignored. Our driver and guide for the afternoon was at the Hotel by 1:30pm and Cla and I were surprised when he led us to a Toyota Land Cruiser. We certainly wasn’t expecting a 4×4 for this trip! As we drove through the town, we were struck at how quiet the entire town was and how everything seemed to be in order. 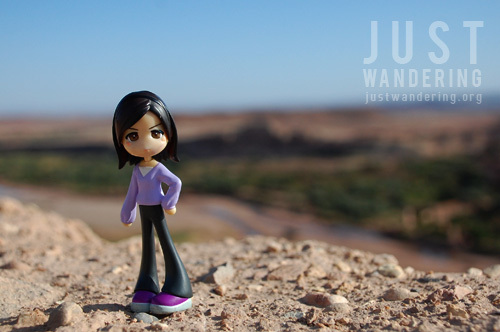 Nicknamed “Ouallywood,” Ouarzazate is home to two film studios, Atlas Studios and Cla Studios (much to the delight of my travel companion). This is where movies like The Mummy, Gladiator, and one of my favorites, Asterix and Obelix: Mission Cleopatra were filmed. Maybe that’s why the town feels like it’s a huge movie set. The driver veered off the main road and we realized why we’re on a 4×4. He drove a path on the trail and soon we were bumping to a stop next to a gorge. While it wasn’t terrifyingly high, it was still pretty impressive and opens to even more vast expanses of nothingness. We huddled back to the SUV after several photos and drove up, down and across streams, passing a herd of goats and a small oasis village. Finally, we got back on the tarmac and followed the road to the fortified city. Unsurprisingly, the road to Aït Benhaddou was lined with souvenir shops and cafe. About 5 minutes’ walk from the car, we came upon a shallow stream that we crossed using a makeshift bridge made of rocks and then a second stream that we crossed by stepping on bags of gravel. The kzar of Aït Benhaddou is a UNESCO World Heritage Site and is a traditional pre-Saharan Habitat and a great example of southern Moroccan architecture. The “earthen construction” ensured that the buildings adapt well to the seasons and provides a cool respite from the dessert heat. 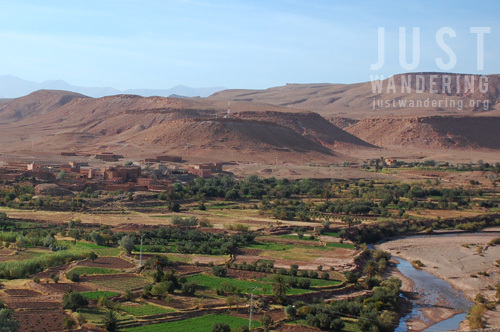 Aït Benhaddou has within its walls houses, a mosque and even a public square. Up on a hill was an observation tower, which gives you a 360° view of the surrounding area. Its Word Heritage status meant that Aït Benhaddou is in every tourist’s Moroccan itinerary. If you’re planning to go here, plan your trip on a weekday to avoid the crowds. Go Mica! May mga budget airlines like Ryanair and EasyJet that fly from the UK to Morocco! Wonderful pics and details of Morocco. I’ve been to several Asian countries and would be eager to explore Europe including Morocco. Can you give me tips? Like visa or any requirements and planning out an itinerary? Hi Cel, if you are holding a Filipino passport, there’s no need to apply for a visa for Morocco. For Europe, however, you’d need to get a Schengen visa, which is valid for 25 countries. You can download my Project Morocco file, which has our itinerary and budget, as well as list of resources we used for planning the trip. Enthralled reading your exploits in Morocco especially because one of my favorite suspense-action novels, Mrs. Pollifax and the Whirling Dervish, was set in that exotic country. I could definitely connect with the names of the places. Have you seen a whirling dervish when you went there? I am really curious how they do it.